Iosif Vissarionovich Dzhugashvili was born on 18 December 1879 in Gori, Georgia, which was then part of the Russian empire. His father was a cobbler and Stalin grew up in modest circumstances. He studied at a theological seminary where he began to read Marxist literature. He never graduated, instead devoting his time to the revolutionary movement against the Russian monarchy. He spent the next 15 years as an activist and on a number of occasions was arrested and exiled to Siberia. Stalin was not one of the decisive players in the Bolshevik seizure of power in 1917, but he soon rose through the ranks of the party. In 1922, he was made general secretary of the Communist Party, a post not considered particularly significant at the time but which gave him control over appointments and thus allowed him to build up a base of support. After Lenin's death in 1924, Stalin promoted himself as his political heir and gradually outmanoeuvred his rivals. By the late 1920s, Stalin was effectively the dictator of the Soviet Union. His forced collectivisation of agriculture cost millions of lives, while his programme of rapid industrialisation achieved huge increases in Soviet productivity and economic growth but at great cost. Moreover, the population suffered immensely during the Great Terror of the 1930s, during which Stalin purged the party of 'enemies of the people', resulting in the execution of thousands and the exile of millions to the gulag system of slave labour camps. After World War Two, the Soviet Union entered the nuclear age and ruled over an empire which included most of eastern Europe. 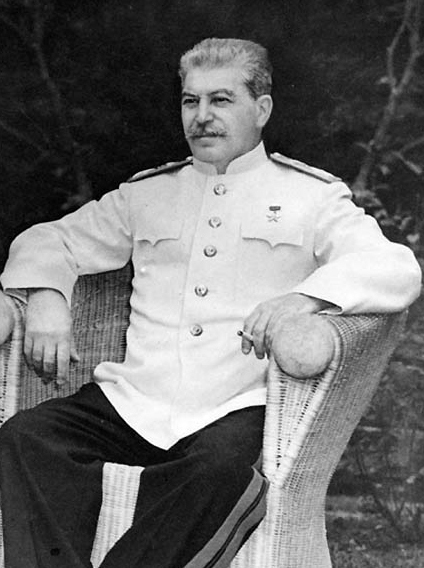 Increasingly paranoid, Stalin died of a stroke on 5 March 1953. You do not lament the loss of hair of one who has been beheaded. When we hang the capitalists they will sell us the rope we use. A sincere diplomat is like dry water or wooden iron. The Pope? How many divisions has he got? I believe in one thing only, the power of human will. I trust no one, not even myself. We think that a powerful and vigorous movement is impossible without differences. "True conformity" is possible only in the cemetery.